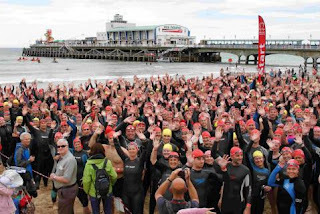 Chris from Waterside Boat Sales, a Tenant at Trafalgar Wharf, took part in the 2012 British Heart Foundation, Bournemouth to Boscombe, Pier to Pier swim on July 15th. The total distance of the swim was 1.4 miles, which is 2,253 meters or 90 lengths of a 25 meter pool! All the sponsorship went to the British Heart Foundation who carry out lifesaving heart research each year and need support and funding to continue developing lifesaving treatment. "I made sure I was one of the last of the 1400 swimmers to go in (just in case it was too cold) and completed the swim in 46 minutes. We had set a target of £500 and raised £720 in total, so a big thank you to everyone at Trafalgar Wharf who helped us reach this amazing amount of money."